The discussion below offers methods solving the turret traverse difficulty sometimes found with Tamiya tanks. These methods have been implemented on two Tiger I's, King Tiger and Pershing, although other tanks should benefit similarly. There are two outstanding issues explained below. Theory: The turret rotation unit for the Tamiya tanks has been known to be an inferior controller for rotating the turret reliably. The reason for the failures are more determined by the engineering design than the quality of construction. There have been several offered solutions and besides replacing the unit for a better design, the following is offered as a modification to improve performance. As it has been observed that gluing the clutch mechanism does help, slippage and hang-ups still occur. The slippage occurs at this point because the gearbox housing flexes under stress causing the metal plate, which the gears are mounted to bow out as the unit teeth slip over the edges of the ring gear teeth. The plate holding the drive gears is an open box structure and does not provide enough strength for heavier turrets sometimes becoming warped from usage. Reinforcing the open gearbox will assure good contact between the ring gear and drive gear and prevent slippage due to box flexing. Actually the gearbox is more than sufficient to rotate heavy turrets as tested by holding the gear with fingers to prevent turning. The amount of torque can be felt and in fact the motor will eventually stall under the pressure without breakage or gears slipping. Solution: The simplest and most cost effective solution is to add tie wraps around the gearbox to secure the open box structure together as shown in the photo below. This configuration will allow maximum force to be imparted to the ring gear without the gearbox flexing. By locating the tie wraps just below where the turret ring gear seats in the drive gear, a more rigid structure is created providing resistance to outward flexing of the bottom gear plate. Pull the tie wrap snug and secure in place with a few beads from a hot glue gun. Just zip the tie a bit tighter if your testing reveals they are too loose. You can always cut the ties off and try again if too tight as well. Constructing a metal case about the open box structure could also be done with some metal working skill. This would also aid in preventing wires from becoming caught in the rotating gears. Important Note: This modification provides no safety feature for the gun catching on an object while driving which may cause damage if the geared clutch has been disabled (glued). This modification works well with the clutch mechanism enabled, although stiffening the clutch may be necessary depending on the load of the turret and performance desired. Theory: As said previously, the turret rotation on Tamiya tanks is a frequent failure. Permanently gluing the clutch mechanism or stiffening the clutch will improve performance for heavier turrets. The King Tiger is a bit better in design utilizing a continuous outer ring for the turret ring to sleeve into allowing less play than the Tiger I or Pershing. Another believed design reason the rotation unit fails is the small gear area that engages the turret ring. With only one or two teeth engaging the turret ring at any one time, slippage is bound to occur even with the best-aligned turret. A larger diameter gear with say four or five teeth engaging the turret ring at any given time would increase the surface area of contact. The increased surface area will provide less slippage and increase the life of the gear since the load is distributed over more teeth. This would cause some redesign and geardown of the mechanism, but a good fix to this known problem would be well worth it. Solution: Add thickness to the turret sleeve (ring) that slides in the hull top opening to minimize slop. By using metal tape (used for HVAC duct work) the thickness of the turret ring can be gradually increased for a precise fit. 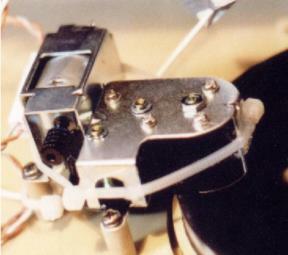 By using metal tape the resistance to rubbing is low and the metal tape is resilient enough to last. It also adheres very well (designed for metal adhesion). The best feature of this modification is that it is non-destructive, i.e. no clutch gluing (although this helps with heavy guns/turrets), no tab breaking and no mechanism replacement. In addition, anyone can add this improvement without any technical or scratch building skill. Results: After the turret ring was furred out with tape (I used 4 concentric layers to increase the film thickness), the slop was removed to less than 1/32 inch. By comparison I noted the guide rollers typically used to align the turret gear ring, actually were misaligned. Only two rollers engaged the ring while the third had about 3mm of slop. This slop was enough to cause the turret drive gear not to align properly. Other design considerations: The turret gear ring should have a third mounting point to the turret fighting compartment (three points make a stable plane of alignment). This prevents the turret and gear ring from becoming skewed relative to each other, which directly affects gearing causing gear walking. Also the width area of contact with the gears can be increased about 1mm by shaving down the raised portion of the mounting hole where the metal brace of the turret gear encounters the turret fighting compartment. I have used cross members with metal tracks for my Tiger II with good success. I had the same theory as others that the hull needs stiffening to avoid transfer of stress from the front to the rear as well as the gearbox mount to the bottom of the hull. I have used metal tracks (one of my Tiger I's and my Tiger II). I like the results. The hull/motor structure was reinforced to cope with the additional stress generated by the metal tracks. The solution involved adding two aluminum braces (cross-members) to the front. One over the top of the motors securing the top of the motors to the hull top forming a kind of rigid box structure and a second member about 2 inches back secured to the hull top as well to avoid hull twisting and help create a lateral box structure for the top of the hull. For the Tiger II, the upper hull is rigidly mounted to the lower hull (still removable) by adding 4 bolt and metal mounting points to further stiffen the rear and spread the load over the whole hull structure. The same techniques were used for the Tiger I as the Tiger II plus metal 'L' braces were added down the sides of the hull similar to the rails used in the 56018 kit. The speaker box is bolted to the hull functioning as a rigid box to keep the hull from twisting. The Tiger I is really rock solid. As for performance, its great especially its powerful pivoting turns in grass and dirt. The additional bracing helps keep the turret mechanism aligned as well over rough terrain with less failures. The P4 was built straight from the box without any modification to the gearbox or drive/idler sprockets. I wanted to see the performance of the kit without the upgrades, though a DMD was installed for the speed control and servos to rotate the turret and elevate the main gun, but other than that, its all original Bandai material. The tracks: The original Bandai tracks were used but to run the vehicle each link was pinned. Paper clip wire was used for this task since it is readily available (and cheap!) and would be easy to cut and bend. Each track link was drilled with a 1/16th drill bit to accept the paper clip wire pin. This work is tedious and it is strongly recommended using a drill press at low speed to accomplish this as the alignment of the pin holes is critical for alignment on the drive sprocket to preventing a thrown track. Small brad nails as pins which have a neater appearance would work as well but may be more difficult to work with. Track installation: The most important concern before running is to be sure the tracks are installed with no slack, not tight but just enough tension that there is no sag between the wheels. This has to be done since the Bandai models do not have active suspension, unlike Tamiya models, which maintains constant tension on the tracks with the active suspension. Performance: During the first ten minutes of running the right gearbox froze up and it had to be dismantled and re-lubricated - this was corrected. Thereafter the running was good, it could climb over grass, dirt, mud and asphalt with ease. The tank could perform neutral turns and run at full speed without throwing a track. The Bandai gearboxes actually have a scale speed that is near to realistic speed, in this case being slower than the Tamiya Tiger II (King Tiger) with new gearboxes. One point of concern with the performance: The Bandai gearboxes will gradually self-destruct. By this I mean when running, the tank makes a horrible grinding sound since all the gears are metal on metal, they gradually grind away at each other and you will find brass metal shavings all inside the hull of the tank. Moreover, from inspection of the gearboxes, the steel gears dig excessively into the brass gears partly because of the small surface area of contact between the teeth. Nevertheless, as a runner it performs well - for a Bandai - just have to replace the gearboxes sooner. 7255035. Test was performed in a existing Sherman using a JR Quatro radio with an R700 receiver.